What’s the first thing you notice when you come to Mid County Lanes in Middletown? For us it’s the sounds. A ball rolling down the hardwood lane and the unmistakable clang of pins being knocked down. We all know how the game works, but have you ever wondered what’s going on behind the pins? In honor of National STEM day, we thought we’d give you a quick glimpse into the engineering and mechanics behind a bowling alley. There are two components in every bowling alley that make it all come together. 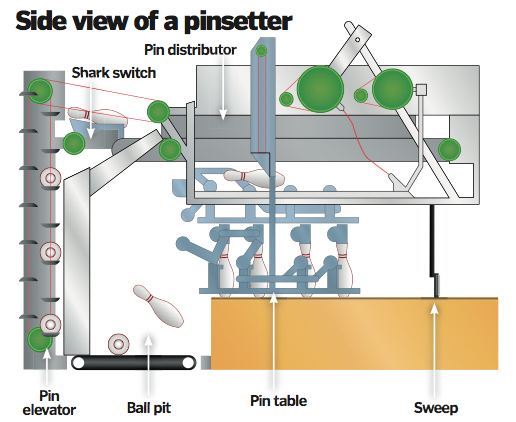 The pinsetter and ball return machines are at the heart of all those strikes, spares, and gutter balls. But how on earth do they do what they do? The sweeper arm comes out and pushes all those knocked down pins into the ball pit. The pins and ball are sorted and each goes to their designated areas. 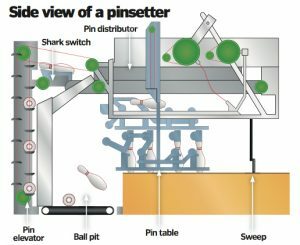 Your ball is sent to the ball return and the pins are sent up the pin elevator where they are dropped into the pin distributor. While the pin distributor gathers up the pins and puts them back into their triangular stack, your ball is sent on a conveyor back to the front of the lane so you can do it all over again! The best way to see it all in action is to come down to Mid County Lanes with your school and have a STEM field trip. We’ll show you how it all works and let you bowl a few games to see it in action! Give us a call today to find out more about booking you school trip.